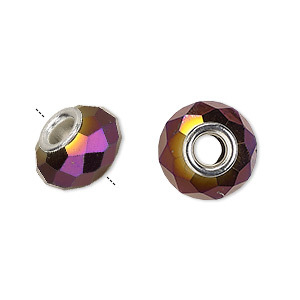 Bead, Dione®, glass and silver-plated brass grommets, 32-facet, opaque metallic dark purple, 14x9mm faceted rondelle with 4-4.5mm hole. Sold per pkg of 6. Item Number: H20-9133GL Have a question about this item? 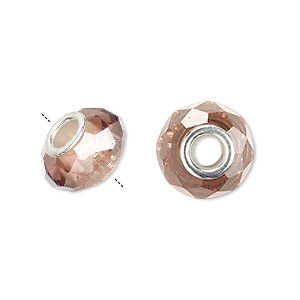 Named for Dione, the mythological mother of Aphrodite, this sparkling selection of Dione® (dee-OH-nee) large-hole beads features solid color glass rondelles, each with 32 shimmering facets. According to Greek mythology, the prophetic Titan goddess Dione and Greek god Zeus were mother and father to Aphrodite, the goddess of love and beauty. Much like Dione, who brought desirable beauty into the world, the sparkling large-hole glass rondelles bring exquisite appeal to jewelry designs. 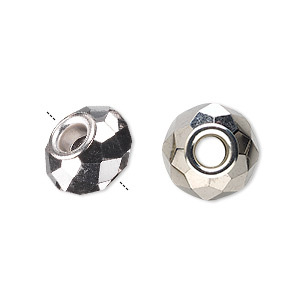 Commonly known as the Add A Bead system for popular mix-and-match bracelets and necklaces, these customer favorites are designed with silver-plated brass grommets and can accommodate chain and cord up to 4mm in width. Beads are machine cut and faceted. Center hole is 4-4.5mm. Beads may vary up to 1mm in size. 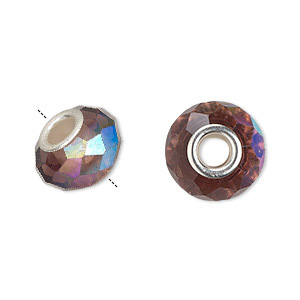 Bead, Dione®, glass and silver-plated brass grommets, 32-facet, opaque metallic dark silver, 14x9mm faceted rondelle with 4-4.5mm hole. Sold per pkg of 6. 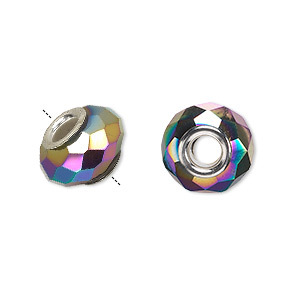 Bead, Dione®, glass and silver-plated brass grommets, 32-facet, rainbow opaque metallic, 14x9mm faceted rondelle with 4-4.5mm hole. Sold per pkg of 6. 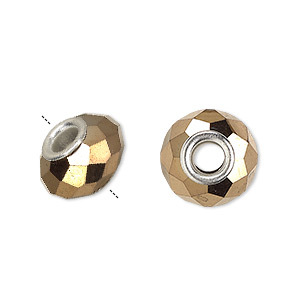 Bead, Dione®, glass and silver-plated brass grommets, 32-facet, opaque metallic bright gold, 14x9mm faceted rondelle with 4-4.5mm hole. Sold per pkg of 6. 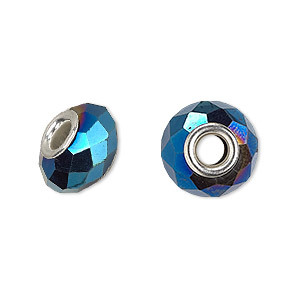 Bead, Dione®, glass and silver-plated brass grommets, 32-facet, opaque metallic dark blue, 14x9mm faceted rondelle with 4-4.5mm hole. Sold per pkg of 6. 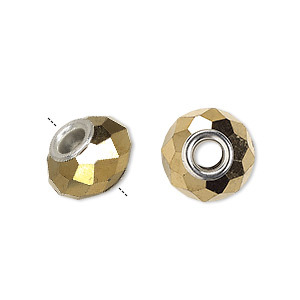 Bead, Dione®, glass and silver-plated brass grommets, 32-facet, opaque metallic dark gold, 14x9mm faceted rondelle with 4-4.5mm hole. Sold per pkg of 6. 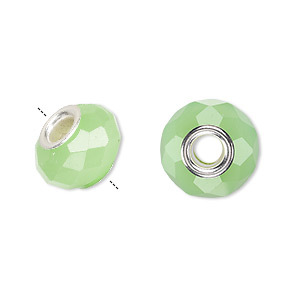 Bead, Dione®, glass and silver-plated brass grommets, opaque light green, 14x9mm faceted rondelle with 4-4.5mm hole. Sold per pkg of 6. 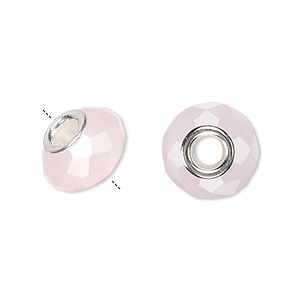 Bead, Dione®, glass and silver-plated brass grommets, opaque light pink, 14x9mm faceted rondelle with 4-4.5mm hole. Sold per pkg of 6. 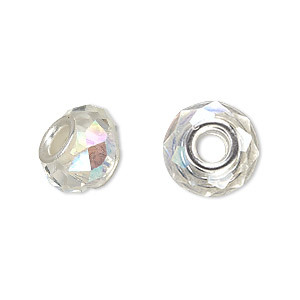 Bead, Dione®, Celestial Crystal® and silver-plated brass, 32-facet, clear AB, 13x9mm-14x10mm faceted rondelle with 4.5mm hole. Sold per pkg of 10.